Eat foods that burn belly fat to be healthy and get a flat stomach. 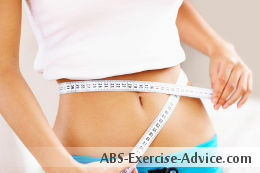 Foods that burn belly fat, combined with a well-rounded exercise program, can catapult you into the body of your dreams. You have to eat anyway, right? So why not eat foods that will help you get a flat stomach? One of the most effective ways to improve your health is to adopt a gluten free, dairy free whole food diet. That means eliminate processed foods and focus on eating foods that are as close to the way they're found in nature as possible. Notice that the foods on this list are all gluten free and dairy free. 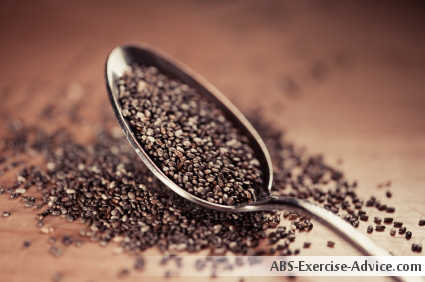 Tiny chia seeds pack a powerful fat fighting punch. High in fiber, antioxidants, protein, and Omega 3 fatty acids, they can help reduce cravings and improve your sensitivity to insulin. Since insulin signals your body to store fat, improving your sensitivity to it will help you burn belly fat faster. Here's a free video that explains more about how insulin affects your ability to burn fat. I find the easiest way to include chia seeds in my daily diet is to add about a tablespoon to my homemade green smoothie that I drink first thing in the morning or after a workout. I prefer them to flax seeds because you don't have to grind them before eating them. While chia seeds are starting to become more widely available in health food stores and even traditional supermarkets, they tend to be severely overpriced. You can find much better prices online. Use this search box to search for the best prices for chia seeds at Amazon. Fresh greens cover a wide variety of vegetables, from lettuce and spinach to kale and endive. 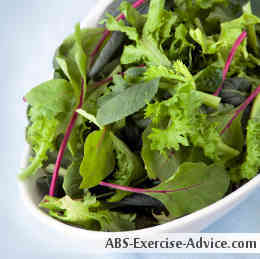 Greens can help keep you full, have loads of fiber, and don`t spike your blood sugar levels. Spinach and swiss chard work well in green smoothies. Kale, arugula, and romaine and other lettuces are nice for salads. Use cabbage varieties for homemade kimchi, cole slaw, and soups. Add flavor with fresh herbs like parsley, basil, and cilantro. I like to explore the produce section and try something new each week. Although avocados get a bad rep because they're high in fat and calories, they're also high in many fat fighting nutrients and one of the healthiest foods you can eat. They help lower cholesterol. Cholesterol increases belly fat storage. Lower your cholesterol, lose belly fat. They won't spike your blood sugar, helping to improve your insulin sensitivity. They fill you up and banish junk food cravings. They improve bowel function, reducing belly bloat. They're a natural source of an amino acid called L-carnitine, which increases your energy and is vital to your body's fat burning process. They're high in B vitamins, which give you energy. As long as you follow a whole food diet, you don't have to worry about the high calories and fat in avocados because you won't be consuming a bunch of empty calories like what you find in processed foods. 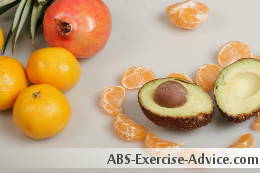 In fact, the type of fat avocados contain actually helps you burn fat off your body. Watch this free video to learn which kinds of fat help you burn fat and which kinds of fat make you store fat. The familiar banana's fat burning power comes from its high amounts of fiber, vitamin B6, vitamin C, and potassium. Potassium builds muscle, boosting your metabolism, and helps balance your electrolytes, preventing water retention and reducing belly bloat. I like to eat bananas when I need a quick snack and use them to sweeten green smoothies. Studies show that green tea acts as a metabolism booster, helping you shed weight from all areas of your body, including your waist line. Watch this video to learn other ways to supercharge your metabolism just by eating all the right foods. Elevate your levels of norepinephrine, your body's main fat burning hormone. Increase your resting metabolic rate, revving up your fat burning 24 hours a day. Suppress your appetite, helping you avoid over eating. Decrease excess water retention and bloating. Balance blood sugar and insulin levels. The caffeine-EGCG combination work together to boost green tea's effectiveness, so go for the caffeinated variety. Stick to organic teas to avoid gluten, as some non-organic teas may contain trace amounts of gluten in the bag. If you're a coffee drinker, try drinking green tea in place of your morning coffee or try some of these green tea smoothie recipes. 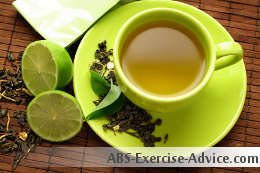 Read more here: Green Tea Weight Loss Story. Organic citrus foods, such as lemons, orange peppers, and oranges contain high amounts of vitamin C. This particular vitamin is known for its boost to your immune system, but it also helps you burn as much as 30% more fat during aerobic exercise. Vitamin C also helps your liver make carnitine and can even increase resting metabolic rate in older adults. Grapefruit in particular can help balance insulin levels and prevent fat from being stored in the body. Many berries, such as strawberries and blueberries, are high in antioxidants. Eating berries before a workout can boost your fat burning by moving more oxygen to your muscles. They're also high in vitamin C and fiber, particularly raspberries. An easy way to add berries to your daily diet is to use them to make green smoothies or just keep them nearby to grab as a convenient snack. Often mistaken for a grain, quinoa is actually the seed of a plant related to spinach and is another amazing, nutrient rich powerhouse that is becoming more well known and easily available in many standard supermarkets. I love to add quinoa to my soups and salads. Nuts and seeds are high in protein, fiber, iron, zinc, magnesium, copper, B vitamins, vitamin E, and healthy fats. Walnuts are a rich source of omega 3 fatty acids, and almonds are particularly high in magnesium, a mineral necessary for maintaining steady blood sugar levels, helps relieve stress, and reduces bloating. Keep nuts and seeds handy for snacking on when the munchies hit. 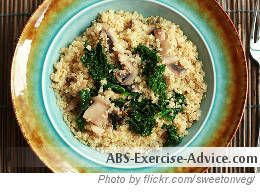 A gluten free, dairy free whole food diet offers many more delicious foods that burn belly fat. Focus on eating unprocessed whole foods in their natural form for the best results. Watch this video to find out how processed foods make you gain fat and prevent you from burning fat. Why are you reading this? Are you just looking for information, or do you actually want to incorporate more foods that burn belly fat into your diet? I know many people reading this article will file it away under "Good to Know" and then just go on about their merry way. They may retain the information and incorporate it into their diet at some point in the future, but more likely, they'll just forget it and continue to do things the way they've always done them ... and continue to get the same results they've always gotten. Will that be you? Or will you put this information into practice, so you can improve your health and get that flat stomach you've been dreaming about? Don't wait for some undetermined time in the future for this change to just happen. It won't happen until you consciously make the decision to make it happen. Make the decision right now to add some of the foods from this list to your healthy eating plan. Pick one food from this list. Decide how you're going to add it to your diet, and then do it. It may help to start with something easy, like eating a green salad every day or keeping nuts or berries handy for snacking on. Add another option from this list next week and another one the week after that. Eventually, your menu will be so full of healthy foods you just won't have enough time in the day to eat junk food anymore! 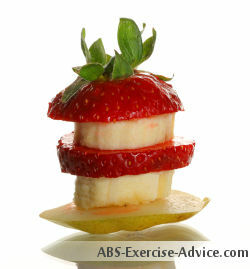 The more often you choose healthy foods when it's time to eat, the stronger your healthy eating habits will become. It can take some time and usually happens little bit by little bit, but it will happen if you stick to it. Now that you know about some foods that burn belly fat, watch this free video to learn about five foods you should never eat. Some of these foods are often promoted as health foods, but actually prevent you from losing weight and even cause you to gain weight! Are you eating any of these foods? This video will also teach you how to create an ideal fat burning environment customized for your body (no calorie counting required!). Click here to watch the free video now. What Are Your Favorite Foods that Burn Belly Fat? Have you had success with certain foods that burn belly fat? Do you get so excited about it that you have to tell everyone you talk to about "what's worked for you"? We want to hear about it! Share your story, tips, and wisdom with us here! If you're all set, click the button and find the first image on your computer. Select it and click on the button to choose it. Visit The Healthcounter pharmacy for a wide range of pharmacy, health & beauty, and prescription products online at everyday low prices.